Pilot Tubing also known as Guided Boring or “light” microtunneling, involves a three-step process: pilot bore, hole reaming and product pipe thrust. 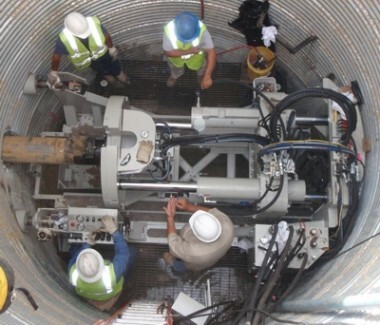 A very high accuracy is guaranteed by an optical guidance system that works in combination with a steerable drilling head, during the pilot bore stage. This technology reveals its great effectiveness for the installation of gravity sewer pipes. The minimum diameter of the starting shaft can be 2 meters (78 in). Pilot Tubing, courtesy of Akkerman Inc.